Altyn-Emel is a national natural park located in the Ili River Valley. At first, the Park was founded to preserve a unique natural complex with archaeological, historical and cultural monuments, rare and endangered species of animals and plants. In the total, the park has an area of 520,000 ha. 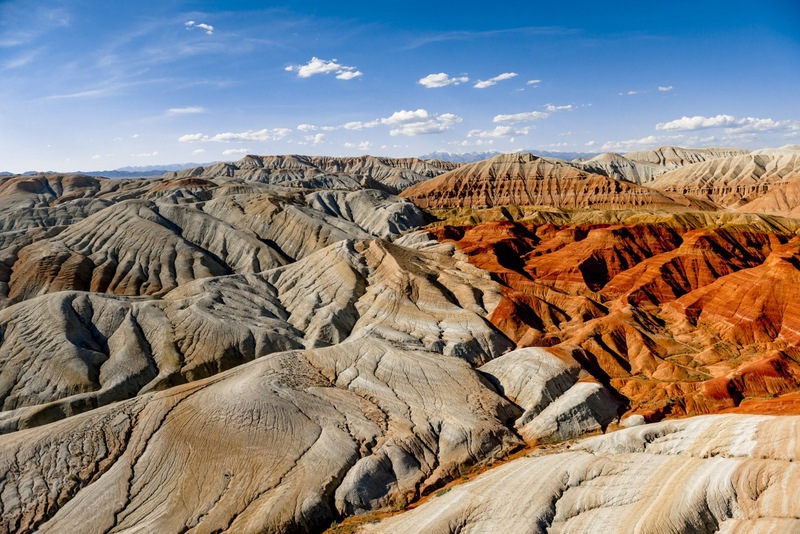 Here is also located red and white coloured mountains called Aktau-Katytau mountains. These mountains are famous for its unique appearance. It was probably created by small volcanoes, erupted and immediately cooled down million years ago. Aktau is red and white mountains in a shape of a pyramid. Katytau is red mountains that have preserved well the remains of volcanic eruptions. Charyn Canyon which is considered to be the largest canyon in the world after the famous Colorado one in America. The first time driving up to the canyon, you understand why he is credited with mystical features. The majestic appearance of the earthly fault could not but generate in the minds of our ancestors’ various superstitions and conjectures. More than 12 million years ago, the Charyn River, flowing from the northern Tien Shan, formed a canyon. Layered massifs, with a height of 150-300 meters, stretched for 154 km. Red clay walls are covered with deep wrinkles and gorges. Numerous beams and ravines form a dense, disordered network. From the top of the canyon, there are picturesque landscapes of snowy Alatau mountains, wide Ili and Syugatinsky valleys. Another phenomenon of the Altyn Emel national park is Signing Sand dune. The name of this dune was given because when the wind blows from the west dispersing the sands, one has a feeling that the pipe organ is playing in the heart of the desert. The Signing Sand Dune phenomena emerged thanks to the wind that had been blowing for million years from Ili river bringing sand to Altyn Emel park. Besides these, you will see Besshatyr, the complex of Saco mounds, which is a historical monument (12th -11th centuries BC). In total there are 18 royal burrows from 8 to 70 meters in diameter, and from 2 to 20 meters in height are concentrated in the area of 2 sq.km. A chain of 45 immovable stone fences lies to the West of the royal tombs from North to South, on which carved are drawings of animals. The Kaindy Lake is located in a middle of a coniferous forest 1867 meters above the sea within Almaty region. It is famous because of its origin. The earthquake created a natural dam which blocked the water and created a mystical view. Most of the spruces, being surrounded by mountain water, are preserved perfectly because of the coldness of the lake. That’s why spruce stems stay there like masts of the sunken ships. The starting point is Almaty. The time from Almaty to the Altyn – Emel national park is about 4-5 hours. Arrival in the National Park. Accommodation and lunch in a guest house. So-called Singing Dune or Signing Sands is a popular attraction in Altyn-Emel. The size of the Dune is enormous: its length is about two-three kilometres, with the height of about 120 metres. What is unique about the Dune is that in dry weather it produces melody-like sounds, which is the very reason for calling it Singing Dune. The ‘song’ of the Dune can be heard even several kilometres away from its location. Do why the Dune sings? The reason might be that the sound is produced when very small grains of sand rub against one another: a gust of wind gives easily audible squeak, and strong gusts – more intense and expressive sounds, which resemble sounds of an organ. However, even in calm weather one can hear the music of the Dune. Yet another mystery about the Dune is that despite the unfixed sand, it does not travel, and remains in the territory of Altyn-Emel for about several thousand years. The legend among the local people says the great Genghis Khan and his faithful warriors are buried under these sands. So the Dune signs when the soul of the Khan, exhausted by the spiritual unrest, tells his descendants about his victories. You will definitely enjoy climbing the sand dune from top of which you can observe the panorama of the surroundings. In the north – the violet-blue ridge of Djungarian Alatau mountains, in the south – thin strip of the Ili River is visible. The Ili River is the largest and longest river in the territory of Almaty region. The Ili River was already a lively shipping route from Western China at the beginning of the 20th century. Vessels and barges began to walk on it as early as the beginning of the twentieth century. After the construction in 1970 of the Kapchagay hydroelectric complex and filling of the Kapchagai Reservoir, the shipping began to fade away, as the river above the Kapchagai Reservoir began to melt, and the reservoir in its eastern part began to silt. After breakfast in the guest house, we start our 2d day tour. First destination is red volcanic mountains. The Katutau (1630 m above sea level) stretches from the southwest to the northeast in the form of a narrow hilly-ridge ridge with plateau-like peaks. The slopes are dismembered by a multitude of waterless gorges and latches. Bright bands show red clays and bluish-grey limestone sandstones of the Tertiary period. The very word “Katutau” is translated as “severe mountains”. In the Permian period (approximately 240 million years ago) two large volcanoes operated at this site. The mountains are composed mainly of lava and associated volcanic rocks. Katutau is translated in different ways – whether gloomy mountains or empty. Direct translation – Frozen mountains. Indeed, it is easy to imagine how the lava from the ancient volcano froze in a stream, and the wind, after millions of years, completed the sculptural composition. Aktau mountains could surprise you by its red, green, pink or even pale blue coloured stony slopes. The mountains are likely to be risen from the place where there used to be sea, which left its traces on the surface of the mountains. Archaeologists have discovered dinosaur bones in the mountains of Aktau, and remains of other species are being found even today. The main feature of this array is the complete absence of vegetation, so the landscape resembles fantastic lunar landscapes. The mountains are characterized by nakedness and steepness of the slopes. Dinner and overnight at the guest house. Early breakfast. We will depart from Altyn Emel to the Charyn Canyon which is considered to be the largest canyon in the world after the famous Colorado one in America. The first time driving up to the canyon, you understand why he is credited with mystical features. The majestic appearance of the earthly fault could not but generate in the minds of our ancestors’ various superstitions and conjectures. Our first stop is Valley of Castles to which we will actually descend and then walk approximately 2km enjoying the views of this “Medieval castles”. But in order to know for sure that these fantastical walls accept you, we will pass through stone gates. Then continuing our route and taking photos at the Charyn river, it is here while listening to the birds signing you get an idea of eternity. During this tour, our Guide will tell you lots’ of legends associated with the canyon. We continue our route by driving to the Yellow canyon. We will stop at the panoramic site of the Yellow canyon where you will understand why it is also called the “Canyon of yurts”. We trek at the Yellow canyon for another hour while taking photos and then continue our route back to the Valley of Castles. We arrive at the Valley of Castles but from the right bank of the Charyn river. And right here, we like taking a final batch of photos of amazing red towers, nature made 100m walls. While standing on top of the rock stone and below you is a landscape of the Valley of Castles, you will feel that you might be the only person on this planet. Departure to Saty village. Overnight at the guest house. Kolsai lakes are called the pearl of the northern Tien Shan. Three picturesque mountain lakes, located in the northern part of the Tien Shan, are called the Kolsai. The two lower lakes are surrounded by firs, alpine meadows and mountain pastures. The upper lake is among the rocks. Lake Kolsay-1 is clamped in a narrow gorge. The firs here are higher than on other lakes, the water is much warmer. Here you can try mountain strawberries, and lovers of fishing will find their favourite pastime. In the distant year of 1911, on January 4, a strong earthquake occurred in the mountains of Kungei Alatau. A huge landslide created a dam and blocked the mountain river. The gorge and the centuries-old Tangshan firs that grew on its slopes were flooded with water. So nature and created this beautiful lake at an altitude of 1,800 meters above sea level. Seeing Kaiyndy for the first time, it seems that this is a real cemetery of ships! After all, from the turquoise surface of the reservoir here and there, sharp peaks sticking out like the masts of sunken ships stick out. What is this? What secrets does Kaiyndy Lake hide in its depths. In fact, the peaks sticking out of the water are the dry tops of the firs. The trees themselves, as you might guess, were “drowned” in a mountain lake. In any other place, they would have rotted long ago, but in Kaiyndy such cold water (even in July, not higher than 6 ° C), that the trees were literally preserved. So in clear weather they are perfectly visible through the water. Well, and divers can even walk along the paths of this fabulous underwater. In translation, it means “abounding with birches”. But do not be surprised to look around the surrounding Tien Shan spruce – there are birches here too – 5 km from the pond stretches the birch grove. However, not only the beauty of the surrounding nature attracts tourists here – the “highlight” of the local landscape is the Kaiyndy lake itself, or more precisely, what is hidden under the water of this reservoir.